For a long time, there was no manufacturer selling an organic starter fertilizer product and to be honest, not many people cared. The only benefit of having something marketed as an organic starter fertilizer is to help those that are transitioning from synthetic fertilizers that are accustomed to grabbing something with that label when it's time to seed. In this post I'll discuss the one new product that's labelled as an organic starter fertilizer and the role of starter fertilizers in organic lawn care. In the synthetic fertilizer world, anything labeled starter fertilizer has one unique characteristic. It contains a higher proportion of phosphorous than the other fertilizers. Phosphorous is the middle number in the NPK guaranteed analysis on the bag of fertilizer. A starter fertilizer might have a guaranteed analysis of 11-23-10 where another fertilizer from the same like would have an analysis of 26-1-12. Why is Phosphorous Important When Seeding Lawns? Phosphorous is an important nutrient for your lawn. Phosphorous is important for plant cell division and aids in root development. When soil is low in phosphorous the grass will not grow roots as deep as it would if there phosphorous levels were adequate. Getting your new seedlings to grow and establish strong roots is exactly what you want which is why there is such an emphasis on starter fertilizers high in phosphorous. An individual grass seed actually contains all the nutrients it needs to get started. Other than water, it doesn't need anything to go from seed to plant. The nutrients stored in the seed get depleted quickly and by the time the roots are forming it will need to get nutrients, including phosphorous from the soil. If it doesn't find enough it will slow or halt it's development. Why Are There No Organic Starter Fertilizers? So if starter fertilizers seem to be so important in the synthetic fertilizer world, why has there been little development in the organic lawn care industry or demand from consumers until recently? It's pretty simple actually. Organic lawn care isn't just about buying something that's not synthetic. It's also about maintaining a healthy soil. Once you have a healthy soil, you'll have a healthy lawn and adding phosphorous may not be necessary. Phosphorous isn't used up as quickly as something like nitrogen. It also binds to the soil and doesn't leach out as much as nitrogen does so a little phosphorous can go a long way. Excess phosphorous serves no purpose, unlike excess nitrogen that will darken the grass and cause it to grow faster. If your soil already contains an adequate amount of phosphorous, there is absolutely no reason to add any. The best way to find out what nutrients your soil needs is to send a soil sample to your local university cooperative extension office for analysis. Many people will find that they have adequate or even excess phosphorous levels in their soil. Unless your soil test indicates that you need to add phosphorous then adding it may not do anything. Many organic lawn fertilizers are also already high in phosphorous compared to synthetic fertilizers. For example, Ringer Lawn Restore , which is a popular organic lawn fertilizer, has a guaranteed analysis of 10-2-6. Compared to the synthetic fertilizer mentioned above, that's more than 5x the amount of phosphorous by weight in relation to nitrogen. If you've been following an organic lawn fertilizer program chances are you don't have a phosphorous deficient soil. There are also some environmental concerns regarding phosphorous, especially if you live near any body of water. Your local municipality may have also banned or restricted the use of phosphorous containing fertilizers. From what I've read, phosphorous doesn't seem to be so bad if used properly. Once it's applied and watered in it doesn't leach out much unless there is a large excess in the soil. Not every soil is perfect and many people do need to add phosphorous to their soil after consulting their soil test results. There are very few organic soil amendments that are high in phosphorous. The most readily available high phosphorous organic soil amendment is bone meal. It's one of the more expensive soil amendments but as stated previously, it's not necessary to apply as often. Espoma Bone Meal (pictured right has a guaranteed analysis of 4-12-0 which means it's 4% nitrogen by weight, 12% phosphorous and contains no potassium. If your soil test indicates you need to add 1 lb of phosphorous per 1,000 sq ft to your lawn, you would need to apply about 9lbs of Espoma Bone Meal per 1,000 sq ft to reach the achieve the appropriate level of phosphorous. I recently noticed that the Espoma Company has 2 organic starter fertilizers, Pro Granular Bio-Tone Starter and Pro Granular Bio-Tone Starter Plus . They are essentially the same except the Plus version contains endo and ecto mycorrhizae fungi, which I'll discuss further down. These nutrients are derived from feather meal, dehydrated manure, bone meal, alfalfa meal, greensand, humates, crab meal, cocoa meal, and sulfate of potash magnesia. fights fungus and is the main component of Seranade Garden Disease Control , an organic garden disease spray. According to Serenade it controls bacterial spot, powdery mildew, rust, gray mold, leaf blight, scab and more. is a bacteria that colonizes in the root zone and promotes plant growth and helps fix nitrogen. Another fungus fighting bacteria and helps cycle nutrients in the soil. A bacteria used in bioremediation because it can degrade polycyclic aromatic hydrocarbon which is found in fossil fuels. Used in bioremediation of soil. I believe it helps break down organic matter into nutrients plants can use. Used to degrade organic matter and in bioremediation. Secretes acids which helps make phosphorous soluble and more readily available to plants. I think helps fix nitrogen. I think is used in bioremediation. Similar to Bacillus popilliae which is used in Milky Spore Disease type products which help control grubs. Bio-Tone Starter Plus also contains endo and ecto mycorrhizae. These are fungi which attach to the roots of plants which helps increase the root mass. They help the plant get water and nutrients from the soil. Even though I decided to get Bio-Tone Starter Plus instead of the regular Bio-Tone Starter fertilizer, I'm not completely sold on the benefits of mycorrizae especially in the context of this organic starter fertilizer. From what I read, when the plant needs the help of mycorrizae it secretes carbohydrates from its roots. These carbohydrates attract and feed the mycorrizae. If the plant is growing in a soil that already has adequate phosphorous levels, it will grow large, deep roots on its own and not need the help of the mycorrizae. Since the starter fertilizer is already high in phosphorous. These microorganisms should already be in your soil and some people feel adding them is a waste of money. I think that they are beneficial, especially when it comes to soil that has been previously treated with synthetic fertilizers. I have personally seen good results with microbial containing products such as Organica Plant Growth Activator Plus which I now apply regularly to help prevent lawn disease. Bio-Tone Starter Fertilizer seems like a good product to use when you're laying down new sod or seed. It can also be used for transplants and other areas of your garden. This is an interesting account of Jesse Eldrid that used Bio-Tone Starter to help boost his Amaranth plant's growth so he can acheive the world record height. The smell isn't too bad, it smells a lot like ORGANICA BIO-MATRIX which is my favorite organic liquid fertilizer. The smell goes away in a couple of days. There are no spreader settings on the bag or on Espoma's website. I just did what I usually do. I know the approximate square footage of each area of my lawn so I just determine how many lbs I need to apply to each area, set my spreader to a medium setting and make multiple passes until it's done. After the first pass I see how much is left in the hopper and adjust the spreader up or down accordingly. With organic fertilizers you don't have to worry about burning the lawn. Making multiple passes also helps insure even coverage. I start going north to south, then east to west. The bag has a couple of holes that act as a handle which I found convenient. Other big bags of Espoma products have the same built-in handle. After spreading the fertilizer it's important to water it in. 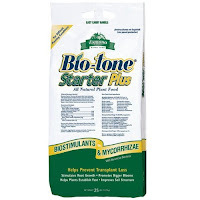 The best time to apply Bio-Tone Starter Fertilizer is 2 weeks prior to seeding or sodding because organic fertilizers need to be broken down by the soil microorganisms before their nutrients are readily available to plants. Before deciding to use Espoma Bio-Tone Starter I would recommend you do a soil test and see if you need that much phosphorous. If you don't, but you still need to add nitrogen and would like to add the bacteria found in Bio-Tone Starter you can use Espoma 30LB 7-2-2 Lawn Food which contains less phosphorous and all the microbials in Bio-Tone Starter, except for the mycorrizae in Bio-Tone Start Plus.